Area (approx): 1020 sq. ft.
$5,000 reduction, fantastic deal! Pride of ownership shows throughout this home. 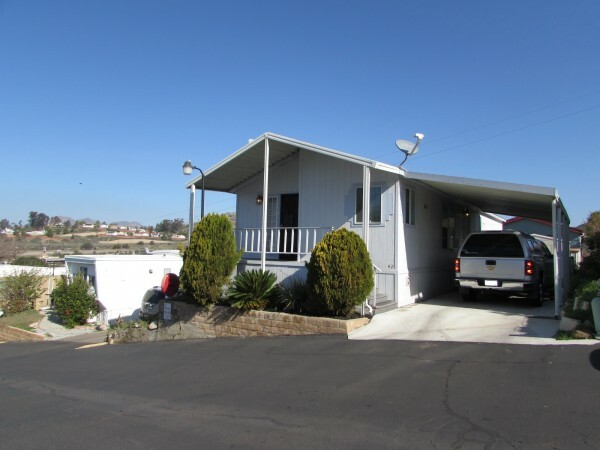 This 2001 manufactured home has been cared for very well, it features 3 bedrooms, 2 bathrooms and a good size living room. Beautiful kitchen with gorgeous light colored cabinetry, ample cabinet/counter space. Stove with convection oven, microwave over the stove, dishwasher and refrigerator are all included. Formal dining room, indoor laundry room with washer and dryer included and a large storage closet. Master suite offers a walk-in closet, an en-suite bathroom with a deep oval tub. 2nd and 3rd bedrooms have full size closets. Guest bathroom, newer carpet throughout, newer water heater and exterior was painted recently. Drink your coffee while enjoying the views from your own covered porch. Large carport, storage shed and window ac. Great location within this peaceful all age community. Easy access to freeway, dining and shopping near by and great school district. This home will sell fast!